The boys at BrewDog, a Scottish brewery, continue in a tradition of tweaking the Olympics via beer. 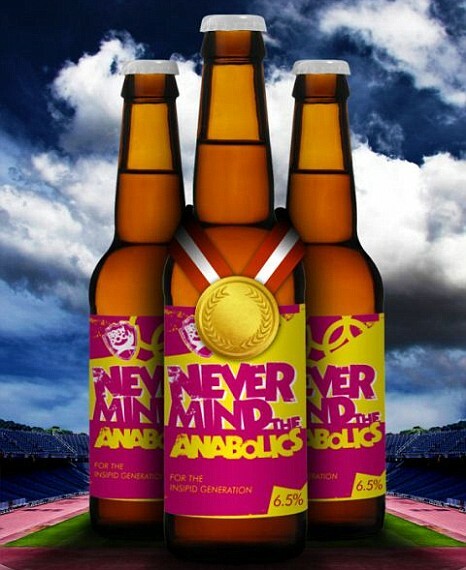 Never Mind the Anabolics is an English India Pale Ale that the brewery apocraphally claims has performance-enhancing drugs. According to a piece in the Phoenix New Times, the beer actually includes just “creatine, guarana, ginseng, gingo, maca powder, matcha tea and kola nut.” It’s been written that an early version did include “steroids,” but I was unable to confirm this. I wrote an earlier piece about how Wasatch Brewing in Park City, Utah, mocked the 2002 Winter Games with its now-retired Unofficial Amber. Link to this video from BrewDog that hypes their historic contribution to The Games. This entry was posted in Beer Snob and tagged Brewdog Brewing, Olympics, Wasatch Brewing. Bookmark the permalink.